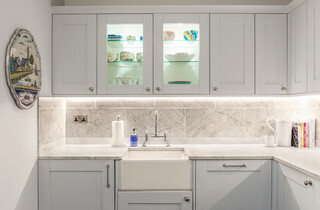 This is a small kitchen in London but really, it would be perfect for an apartment or townhouse, anywhere. Being so light and bright, with very little contrast, this smaller area appears spacious. This entry was posted in decor, Kitchen, Small spaces and tagged appartment, design, houzz, kitchen by topdrawerdecor. Bookmark the permalink.